The wait is over and the Apple Watch is here, at least for those that pre-ordered. So should you put an Apple on your arm? Here’s the good, the bad and the ugly after my first weekend with the device. Back in 2010, when Apple last released a new product category, I bought an expensive 64GB version of the first gen iPad. Apple abandoned it after not much more than two years, dropping it from software updates and making it unusable with some of my favourite apps like Plex that had started to require iOS7 and above. I’m not making that same mistake again, so looking for the least expensive way into version 1.0 of the wearable I ordered the ‘Apple Watch Sport’ at £339. Hardly cheap though. I wanted the black sport band but that only came with the Space Grey faced watch which I don’t like (perhaps because it reminds me of the chipped finish of my iPhone 4). So in the end I went with the silver aluminium with the blue strap. I also ordered a 38mm silver aluminium sport with green band for my better half. Hey, I need someone to send my heartbeat to. The stainless steel cased ‘Watch’ starts at £519 so the difference in price is substantial. I’m not even going to talk about the gold ‘Edition’. The two sizes are obviously broadly aimed at men and women. The 42mm is a little smaller than I imagined and has the benefit of better battery life so I’m sure some ladies will go with it. Likewise there may be some men who prefer the 38mm. There’s only 5g of difference in the weight between the 2 sizes (10g for the stainless steel version). The Sport has a 7000 series aluminium case and ‘Ion-X’ aluminosilicate glass for the face, whereas the stainless steel cased ‘Watch’ (damn this naming is confusing) uses a harder sapphire crystal face and is much less likely to scratch. The backs that house the optical heart rate sensors are different too with the Sport using a ‘composite’ and the Watch using ‘ceramic’. All the internals of the watches (soc, ram, flash, screen, sensors etc) are identical. 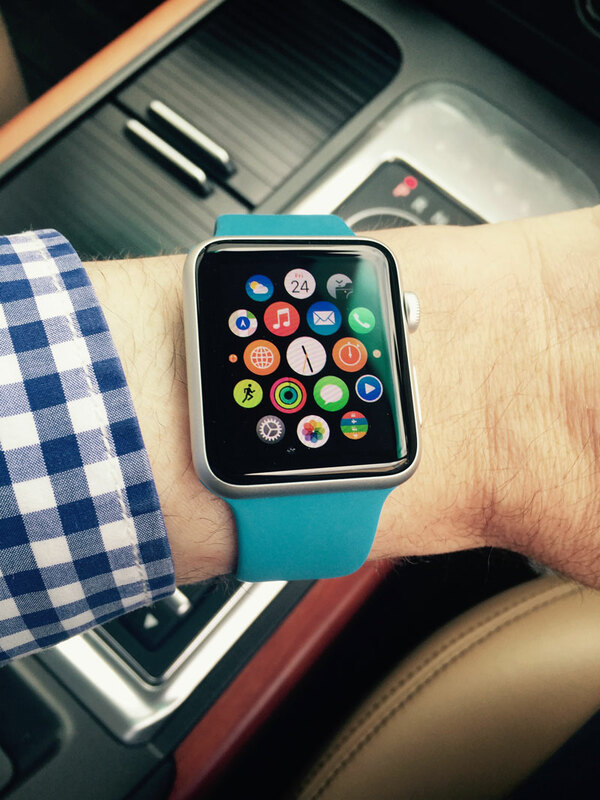 If you must have a round smartwatch then you’re going to have to look elsewhere. As with phones there’s always going to be a much wider choice with Android. As you’d expect from Apple the fit and finish of the device is beautiful. While I’ve never worn a Pebble or Android watch, this is a level above the ones I’ve handled in the past. The video below from the iFixIt Teardown of the Apple Watch gives you an idea of how intricate and complex this little chunk of tech on your wrist really is. There’s an ambient light sensor behind the display and you can take advantage of it, covering the screen with your palm to mute an incoming call for example. The Watch talks to your phone with its Bluetooth 4.0 radio and it has its own onboard Wi-Fi too (802.11b/g/n 2.4GHz). The ‘Taptic Engine’ uses a linear actuator to provide haptic feedback which taps your wrist for notifications along with a chime. That hardware has other uses too and a nice example of this when getting directions on Maps. 12 taps means turn right at the junction you’re approaching, whilst three pairs of two taps means turn left. The IPX7 rating means the Watch is able to withstand immersion in water up to 1 meter for up to 30 minutes. But Apple are downplaying the water resistance of the Watch, minimising expectations and no doubt trying to reduce water damage warranty claims. Saying that, Apple CEO Tim Cook mentioned he showered with his on a few weeks ago and there have already been plenty of YouTubes with people swimming wearing theirs. 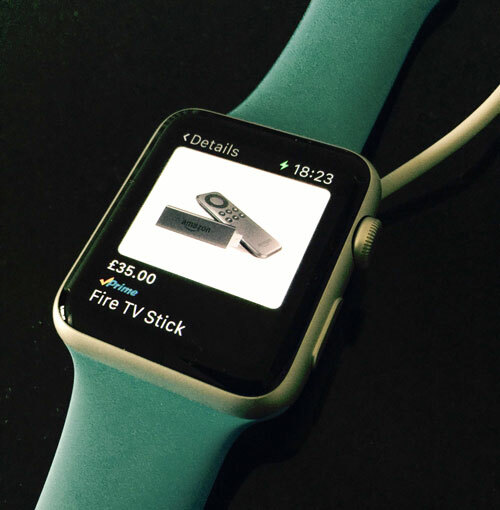 The NFC hardware in the watch is pretty much redundant in the UK until we get Apple Pay. Lets hope we don’t have to wait the same length of time for this as iTunes Radio (which is still not here. Yes Apple, I’m looking at you). The magnetically attached inductive charging system is convenient and works well (the Sport gets a plastic puck charger coil instead of the metal one that comes with the ‘Watch’). The long 2m charger cable is especially welcomed. There are some nice (and hideous) charger stands available already – I like the Twelve South HiRise and may invest in one of these in the future. The new mains charger with its folding pins is pretty nifty (although mine remains in the box as I’ve just used another port on my bedside Anker USB charger). Battery life is always hard to gauge with a new device as you rarely put it down for the first day or two. Apple says “up to 18 hours” and I was keen to test that out. I took the watch off the charge at 7:30 am on Saturday morning after being on charge all night (you can get to 100% from flat in around 2.5 hours). Five hours later (12:30 pm) the battery was at 82%. Another five hours later (5:30pm) it was at 59%, still over half battery left after 10 hours. Another five hours later (10:30pm) and the battery was at 38%. Finally I put it back on charge around 11:15pm with 36% left. Impressive. The watch will fall back to Power Reserve mode as the battery gets to around 10% so even if you have had a busy watch day at least you’ll still be able to tell the time by the end of it. Straps are very much down to personal taste. While I like the look of metal bands I find the front edge of them grinds against my laptop as I rest my wrists on it. The rubbery ‘fluoroelastomer’ sport band doesn’t have this problem and is actually pretty nice. It doesn’t require three hands to put on as you may have read elsewhere, as long as you click the stud in first, then tuck the end away second (the Sport comes with both the S/M and the M/L sized bands included in the box). No doubt an entire industry will grow up around the supply of third party straps and bands in the coming months. The procedure to get the wearable up and running is initiated from the Watch app on the iPhone. You pair the watch to the phone by putting the face in front of the camera. After that the syncing process begins where your apps, music, contacts etc are all copied across. The entire process is painless and takes about 20 minutes (depending on how much you have to sync). It’s still early days and I’m getting used to it more now but when you start to use the Watch it’s confusing with too many ways to control things. The Digital crown rotates to scroll the screen, or you can mostly use the touch screen to swipe to do the same. The crown is also a push button selector, which can also usually be done via a touch of the screen too. But sometimes it has to be done with the touch screen. A good example of this is in the friends screen. Press the little side button to access up to 12 of your most used contacts (the ones set as your favourites on the iPhone). Then use the digital crown to swing around the circle of your nearest and dearest. Now it seems completely intuitive to push the crown in to select the one you want, right? Wrong, that will just take you back to your watch face, apps or Glances. You need to tap the screen here instead, or wait for 2 seconds for that contact to be automatically selected. There’s yet another control, the hard ‘force press’ of the screen does something else (usually a context sensitive option a little like a right click on the desktop). Confused dot com. Apple describes Glances as “scannable summaries of the information you view most frequently”. To access these you need to swipe up, but that only works if you are on the watch face view. Even if you are there and you want to, lets say use the Music controls Glance to go to the next track, then you’ll swipe up to reach Glances, followed by swiping left and right to find the Music Glance (and you’ll need to learn where it is to know whether to go left or right here too). Glances don’t refresh until you call them up either so you’ll have to watch a spinny wheel for a bit when you go into the weather Glance for example waiting for it to update. Some UI touch targets, particularly along the top of the screen are way too small too. The screen is off in normal conditions, only turning on as you raise your arm. This works most of the time but there are occasions when it wont turn on and you’ll need to either tap the screen or lower and raise your arm again. When it does work there’s the slightest of delays which is just enough to be annoying. The screen needs to be powering up as you raise your arm, rather than waiting until it gets to the view position. Of course this is easy for me to say, no doubt this would mean the face being on more often when not required and hence a shorter battery life. 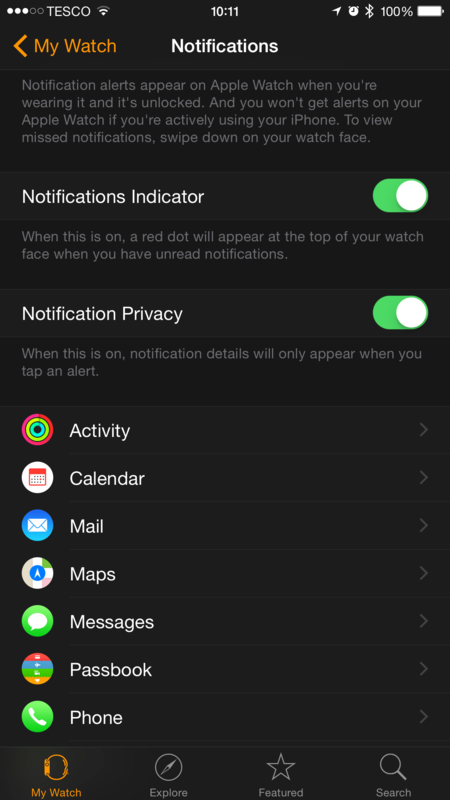 Only Apple has native apps on the watch for now. There’s over 3,000 3rd party apps on the Watch apps store already, these are iPhone apps with various levels of support for the watch – some have accompanying ‘Glances’ for example while others do not. I’ve tried plenty of apps. The Amazon one for example worked well, finding my product first time using voice search. But are you really going to use your watch for this sort of thing rather than take your phone out of your pocket? There are however plenty of things that do make sense on the watch. Receiving an iMessage on your wrist is brilliant. I’ve just received one from my son and with two taps sent one of the standard replies to answer his question (you can customise these from the iPhone app). This is the sort of application that is a genuine shortcut. An authentically better way, an improved experience compared to getting your phone out, swiping to the message unlocking and replying. Exactly what this device is good for. My better half has taken to it surprisingly quickly and has been excited with its capabilities, especially being able to quickly dictate iMessage replies and set timers with her voice too. And (bonus) the built in ability to make your iPhone ring even when on silent from your watch will be a boon for the nightly search for her lost handset. Notifications are also a great use case for the watch. Not having to remove your phone from your pocket in the middle of a meeting, or when driving, when you hear that buzz is great. I wonder how the UK law sees the watch? Putting the obvious should I question to the side for a minute, can I touch my watch to send a text reply whilst driving? I’ve turned off notifications for most apps, leaving the watch to alert me only for the important stuff. For now there’s no granularity here, no way to be notified of just your VIP’s emails for example. There are 11 watch faces to choose from right now. You can customise them and select which ‘complications’ to show and you can save out your modified faces too. But for Apple’s ‘most personal device’ there’s currently no way to add say an image of your family as your watch face. This seems like a strange omission on launch, perhaps it’s the Apple design police not wanting us to ruin their beautiful creation with something so crass? For now there’s no way to add any other faces and no way for third parties to create them with the current SDK either. I’m sure this will change in the future though, along with the update promised for later this year that will allow developers to create native apps for the watch. Raising your wrist and saying ‘Hey Siri’ brings up the voice interface without having to touch the watch, or you can use a long press of the digital crown instead. While it’s far from perfect Siri continues to improve and voice commands (Hey Siri, Play Ronald Jenkees) and searches work well for the most part. There’s a speaker and microphone built in so you can go full Inspector Gadget and make and take calls on the watch without removing your iPhone from your pocket or bag. While this isn’t something you may do often it does work surprisingly well and I can see it being useful on occasions. You can choose a playlist from your iPhone to sync across to the Watch (up to 2GBs) then you can go on a run without your phone and still have music (a force press is used to change source from your phone to your watch). You’ll need bluetooth headphones to do this as there’s no audio jack on the watch. This worked really well with my wireless headphones allowing me to control track and volume directly from the touch controls on my ear. The other area that I believe will be a success for the Watch is in Health monitoring. Word of the day people: photoplethysmography. 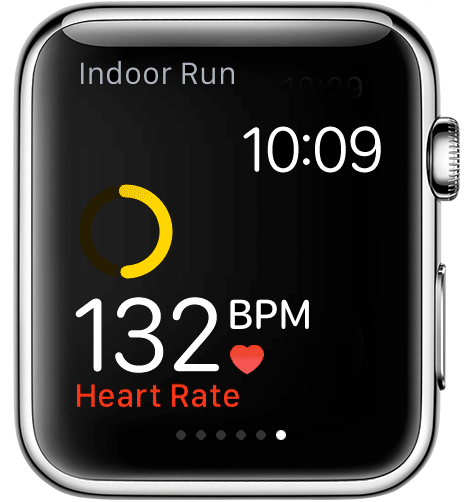 You can read how Apple Watch uses this to measure your heart rate, (Spoiler: it employs green LEDs, infrared light and photodiodes to measure the blood flow in your wrist). The watch automatically records your heart rate every 10 minutes and adds it to the data in your Health Kit app on the phone. You can manually kick off a reading by pulling up the heart rate ‘Glance’ and you can monitor your heart rate continually in the work out app. The Activity app shows your daily activity in the form of three rings, one for how many calories you’ve burned, one to show how many minutes of ‘brisk activity’ you’ve completed and the other to show how often you’ve stood up to take a break from sitting. I’ve already found that the tap on my wrist to remind me to stand is helping with my sedentary work setup. Little interactions and encouragements like this help to gamify these rather dull but important areas of our daily lives. It’s something we’ll no doubt be looking at in detail over time but there are already a few home automation apps for the Apple Watch. Some examples are Philips Hue, Lutron Caseta and Insteon (video below). It remains to be seen which manufacturers ‘get it’ though. The watch is not the right place to try and replicate a full control app from a smartphone. Rather it’s somewhere to bring simple context aware controls that augment the phones functions. Without really doing anything I noticed the Roomie Remote app was already on my watch and a couple of taps had me controlling Plex on the bedroom TV. It’s hard to make many meaningful conclusions when you’re still basking in the warm glow of #NewToy. However it’s clear that while a smartwatch is far from a necessity, it is certainly a nice thing to have. The depth of what it can do has surprised me. My plan for a quick post has turned into nearly 3,000 words and there’s plenty I’ve not even touched on. As with lots of tech though, just because you can do something doesn’t always mean you should. Some roles and apps here make little sense while others are ideally suited to the watch’s form factor and make it a really useful device. While it’s early days for me as a user, it’s also the same for Apple as a designer of a wearable UI. Apple should focus in on what works and forget about the rest. That’s their usual M.O. but it seems not to have been followed here to the same extent as usual. That said, I don’t doubt a lot of the interface issues will be addressed in future software updates, this is v1.0 after all and for a first generation product it’s impressive. Whether you jump on board now, wait for the next generation or bypass smartwatches altogether is a question only you can answer for yourself. For now though I’m enjoying my iPhones little companion on my wrist. 1 Comment on "Apple Watch Review: The Good, The Bad & The Ugly After a Wearable Weekend"
I got the white 38mm Sport but was having reservations that it would look like the old fashioned calculator watches on my arm. No worries though, yesterday at work, no one noticed it (is that a good or a bad thing?) It is a lot more comfortable than I was expecting. I have stuck with the default face but one of my major concerns was would I be able to read and control the watch without reading glasses but so far it has been fine. I walk a 2 mile round trip to work and use my Iphone for music and my MapMyWalk App as well as having a Jawbone Up. I have dispensed with my Up and the app and use the Workout App on the watch. And my music is easily controlled on the watch. I also like the activity tracker and heart rate monitor but I guess I will soon get sick of it nagging me to stand up. I have the ParkByPhone app which is showing up now on the watch but I have yet to try it to see what specific watch functionality it has. Not many of my apps are compatible with the watch yet so it will be interesting to see which apps people are using – I feel that I need to get as much use as possibly to justify my watch but overall I am pleased that I have it.